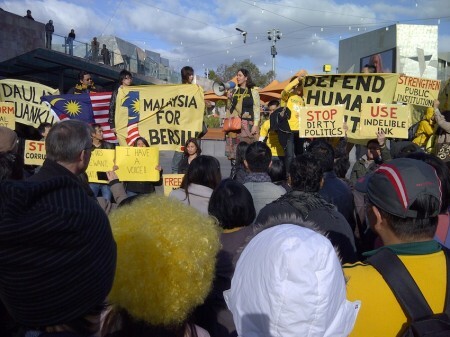 A slightly tipsy Melody Song sent us this exclusive report from Bersih 2.0 in Melbourne. Melbourne is infamous among many Malaysians of the younger set for being a place to head to complete the formative university years. It is also, for that matter, a place where many older Malaysians who had previously studied at return to when starting a family, due largely to a network of friends and family, good public transport system, and a smattering of surprisingly good Malaysian restaurants. 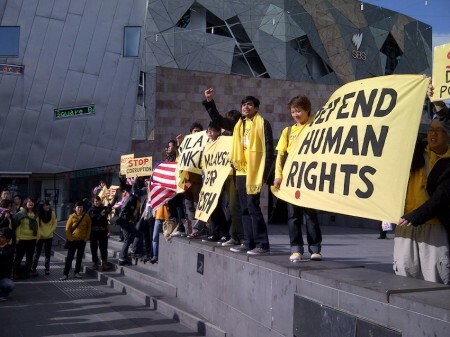 On July 9, a fair number of these Malaysian expatriates and students turned up at Federation Square for the peaceful Bersih 2.0 gathering, organised by Saya Anak Bangsa Malaysia di Australia (SABMoz). 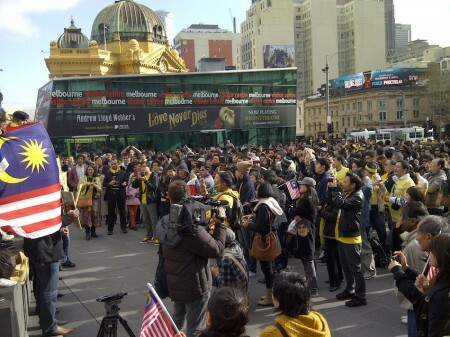 It started off with about 50 people, but by the end of the afternoon, the number had grown to nearly 750 strong, making it reportedly the biggest Bersih gathering in Australia. Come 1.30pm and the crowd had swelled, and the smiles became freer. Families milled about, and the familiar exclaimations in that distinctive accent carried across the crowd. Old friends called out greetings, Bersih shirts were done in quick trade and stickers and Jalur Gemilangs were handed out. The mood was upbeat, yet a tense undertone was still present as well-connected Malaysians shared information on what was transpiring in our nation’s capital of Kuala Lumpur. The crowd was noticeably jittery as sirens sounded in the distance, and a bank’s helicopter whirred overhead. It reflected the culture of fear many of us had gotten used to, but those fears for us were, blessedly, unfounded. The chants and speeches started out tentatively at first, and many stood a good distance away from the leaders of the pack, eyeing the crowd warily. One chap was spotted with sunglasses on and a scarf wrapped around his nose and mouth–no worries, no teargas here, mate. It took a while for the mood to warm, as friends of the organisers took to the “ledge” (vs. the stage) to rouse the crowd with words of support and solidarity for Bersih’s call for free and fair elections. Among those who spoke were a member of parliament for Clayton, a Singaporean who had been involved in the electoral process in its recent elections, and an Australian socialist who pushed on valiantly despite getting the ruling party’s abbreviation mixed up. 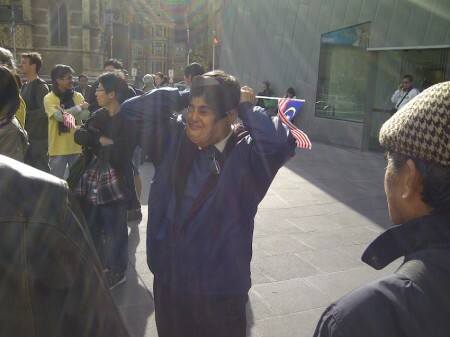 Malaysians who were familiar faces in the social activist circles back home such as the Centre for Independent Journalism’s Sonia Randhawa also spoke, calling for suffrage for Malaysians residing overseas. “Malaysians having to fly home to vote isn’t free–it’s expensive,” quipped SABMoz’s David Teoh, who helped organise the Melbourne gathering. Yet another student shared an anecdote of how a modest parking machine back in KL lifts his spirits everytime he goes to pay, by telling him “change is possible”. Tweets from the organisers here shared how some authorities at Federation Square praised them for organising a peaceful rally. Indeed, the afternoon’s events proceeded quietly and without incident, aside from a disgruntled Caucasian woman grumbling at the front, but she too was soon ushered away by the authorities (whom by some stroke of fate were also in yellow jackets). Even then, the organisers were gracious, telling the crowd “everyone has a right to say what they think”. As spirits soared and the crowd grew more hyped up, so too did the sun break through the clouds on the cold winter afternoon. Believers of democracy and a “fair go” alike chanted “bersih, bersih!” and “hidup rakyat!” and Malaysians recited the Rukun Negara and sang Negaraku. At 3pm, when the police permit was due to expire, so did the crowd disperse. As the organisers said, it was not a gathering to incite hate or violence, it was with love and hope that believers in democracy had gathered in the city in solidarity with those braving the FRU, police, teargas and traffic blockages back at home. It was a show of support for a clean game on a level playing field, belief in the future of the country, and that brighter days are ahead. Melody is a former Edge journo who has recently relocated to Melbourne in the name of love. She continues to love Malaysia from down under, and was mind-controlled by Lord Bobo to write up this post for us. Melody is a former Edge journo who recently relocated to Australia in the name of love. She continues to love Malaysia from down under, and was mind-controlled by Lord Bobo to write for LoyarBurok. Posted on 10 July 2011. You can follow any responses to this entry through the RSS 2.0. Read more articles posted by Melody Song. 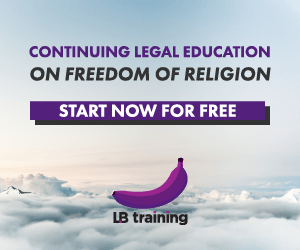 4 Responses to Bersih 2.0 Melbourne! THANK YOU all Malaysians who came to show support for BERSIH and the need for REFORM in our motherland Malaysia . The past years have seen too many acts of evil and corruption. Where murderers (Altantuya,deads in polis custody esp of indian minorities,illegal immigrants etc ) and crooks of publi funds are let off scot free. Which country in the world cover up faces of suspect murderers in court & public ??? Altantuya -we will never forget you and how you died to cover up some terrible looting of millions of public funds ! Because we have a corrupt voting process- phantom & suspect postal votes corrupt polticians are in power. say and do nothing ! FAIR GO FOR MALAYSIANS TOO, THUS BERSIH ! I came, I saw and we overcame the rogues of the nation. The pigs in blue went off the handle! !…UMNO/BN administrators shame, shame, shame. Look at Australian Police, how dignified and civilized the way they handle the whole rally. UMNO PM, where were you? bloody coward! Ever wonder why Malaysian government simply can't make this an example? I kept telling myself that the people wouldn't have turned out to be violent in any possible way if they in the first place are being allowed to march peacefully, no barricades. I hoped to join the rally but due to some reasons, my friend I I did not. But back at home I glued myself in front of the TV and laptop, wishing to be updated with any recent news, since this morning till now. Hope for the best for us all.